Our product range includes a wide range of dual line metering dosers/ blocks. Systematrix Engg Services manufactures a complete range of lubrisys dual line systems. 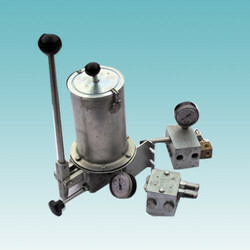 The dual line system consist of a pump of high flow and high pressure to cater to many lubrication points. the main line from the pump is joined to the reversing valve wherein two outlet from the valve leads to the two main lines of distributor blocks that are arranged in series. When one line is on, pressure is developed and all the points of one side of lubrisys metering dosers/ distributor blocks is lubricated. the spools in the distributor move to their extreme position. a pressure is developed as all spools have moved to the end position and cannot move further. This pressure forces the reversing valve to change the direction of the main line and makes the other line operational. At this stage the pressure from the first line is released through the tank line of the reversing valve. the same happens when pressure is achieved in the second line. The common applications for this type of system are conveyors, overhead cranes, steel industries etc. A dual line system consist of lubrisys pump, lubrisys reversing valve/changeover valve, lubrisyselectronic controller or a lubrisys manual pump with lubrisys metering dosers. Looking for Dual Line Metering Dosers ?